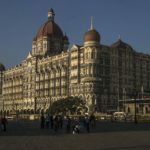 In the area surrounding the Taj Mahal Palace Hotel, the traffic was gridlocked, and security procedures were thorough, and thus, time consuming. The residual precautions from the 2008 terrorist attacks were even more vigilant due to the holiday season. After having our car checked for bombs, we were ushered through metal detectors and our luggage was passed through the x-ray machines. The very moment that we were through the door, the cool air enveloped us and a beautiful, young woman greeted us as new guests. We were given a welcome blessing and bindi, a wooden bead necklace and personally escorted to the reception desk. Clearly her role was to keep watch on those getting out of cars with luggage and ensured they were given the royal Taj treatment the second they walked through the front door. 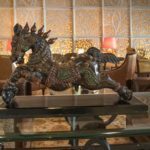 Our friendly greeter escorted us to the reception desk in the Taj Mahal Tower – the new section of the hotel where the large, slick lobby reflects this brand’s contemporary design married with elements of its history. 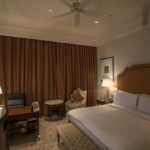 As impressive as this newer part of the hotel is, we had made our reservation in the regal Taj Mahal Palace section of the hotel, wanting to experience India’s outstanding hospitality in traditional, historic luxury. So we were led to the smaller but still resplendent reception desk of the Palace Hotel. 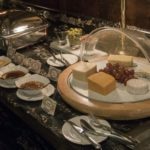 We were presented with an upgrade to the ‘club’ floor, which included complimentary breakfast, high tea, cocktail hour AND cognac and chocolate tasting in the evening. Oh, AND butler service! Excessively wonderful! 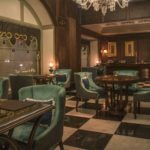 We have stayed at a few different brands that offer an ‘executive’ or ‘club’ experience, but the Taj Club perks far exceed those of any other brand of property we have stayed at. 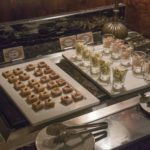 Most offer the breakfast and happy hour combination, but throwing in the other two really makes for a decadent stay! Due to our late arrival, the only thing remaining on our complimentary indulgence menu for our first day was the cognac and chocolate tasting. A Remy Martin VS champagne cognac was provided, a nice choice for a complimentary, endless pour. 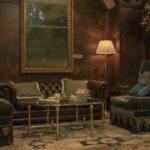 So we sat back in the Palace Lounge in deep turquoise velvet chairs, which complimented the dark American walnut wood and gold tasselled window dressings. The elegance of the room was enhanced by the black and white marble checked floor, Murano chandeliers and the artwork! 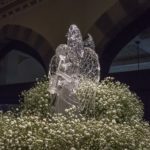 – Wow; original pieces of art worth a fortune! 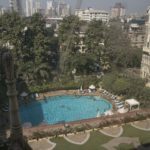 When The Taj Mahal Palace Hotel opened in 1903, it “boasted a series of firsts: American fans, German elevators, Turkish baths and English butlers. The building was also the first in Bombay to be lit by electricity. Eventually it also ended up having the city’s first licensed bar, India’s first all-day dining restaurant, and the country’s first international discoteque, Blow Up” (vogue.in). 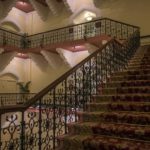 While the original clientele were mainly Europeans, maharajas and the elites, contemporary guest lists have included celebrities, politicians and rock stars. Even President Obama has stayed there – the first guest in the newly completed 13 room presidential suite. But you do not have to have Obama’s credentials to receive the royal treatment at the Taj Mahal Palace Hotel, you just have to make a reservation and show up! Our Luxury Grande city view room was spacious and of excellent design. The warm caramel tones of the soft drapes complimented the pale textured papered walls and cream, marble topped tables. 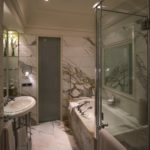 The soft grey marble that covered the floor and walls of the bathroom was ribboned with smoky grey accents, cool to the touch and understated in its character and elegance. 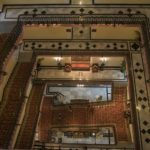 Most hotels of this calibre should be able to provide such sensible and thoughtful details in their design, but oftentimes they are overlooked. In the Taj, the ‘night light’ setting provided the perfect amount of light at night to go to the bathroom, and the simple (yet, often neglected) position of the bench for the suitcases was of a height where no bending was necessary, so dodgy backs were not aggravated (AND it was large enough for two suitcases, which is not as common as one would expect – how many couples travel with just one?!). A restful night’s sleep followed (due to the cognac or the wonderfully comfortable bed? – the best of the whole trip) and we rose refreshed to have buffet breakfast in the Sea Lounge. They were very busy which meant specific orders proved challenging (having to chase up orders like toast and ginger tea), but the food was of both an excellent quality and good range. The space was packed with people, and it was impressive to see how efficiently and quickly waiters were dealing with such a large number of guests. We enjoyed the Indian breakfast, but then also discovered a supply of fresh hummus – a delicious reminder of home! Having a driver for our exploration of Mumbai was such an excellent choice as the Mumbai traffic leaves Delhi’s congestion issues for dead! 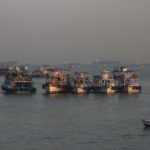 (To read about our adventures in Mumbai, click here.) 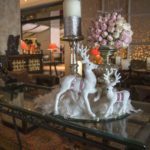 Our afternoon return to our haven at the Taj Palace Hotel was timely – we were able to freshen up before the Club Happy Hour (which is actually 1.5 hours). So our delightful evening after a very full day was spent relaxing in the Palace Lounge sampling the wine and canapés on offer, before our segue into the cognac and chocolate tasting component of the evening. The experience was made even more enjoyable by the attentive service and pleasant company of our waiter, Rahul Singh (who was also on occasion our butler). 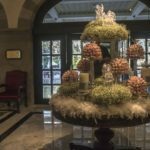 The level of service at the Taj Mahal Palace Hotel surpassed everything else we experienced on this trip. And it was sustained throughout our stay in subtle and thoughtful ways, not just the obvious and usual level of service. 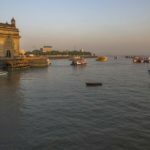 The day we went to Elephanta Island, there were two brass bowls filled with rose petals awaiting us on our return. All that was needed was the addition of hot water and salts to ease our aching feet. And there was no drawing of that water ourselves – there was a handwritten card instructing us to call our butler for assistance, so of course we did! 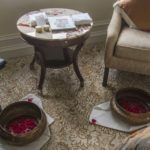 So the lovely Arif prepared our footbaths and told us that he would leave the bowls with us instead of clearing them after our soak, enabling us to repeat the process before bed, bringing more salts at the turn down service. The next night there was a single rose left on the pillow at turn down, the following night a vase of red and pink roses appeared on the table. 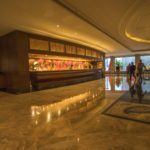 Nothing tests a hotel’s level of service like a guest’s illness! I needed to call the hotel doctor to deal with a persistent upset stomach. 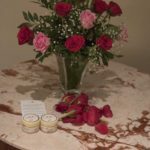 She was prompt, wrote prescriptions (which were filled and delivered to the room), and her visit was charged to the room to settle on check out. The cost of the house call was 1,300 rps ($26 AUD). Not bad for one of the finest 5 star hotels in the country! To show their concern for my well-being, MORE flowers were delivered to the room, as well as a present of a stuffed cotton elephant. Throughout our stay, the housekeeping staff were incredible, and wouldn’t even accept a tip for the footbath service! Sweet people, and perfect hosts! 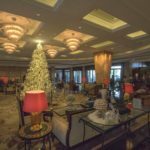 They were expertly led by Housekeeping Executive, Manmeet Kaur, a smiling young woman who anticipated the needs and desires of all her guests, and who personally bid us farewell when we were leaving. 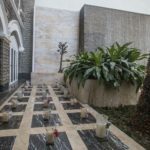 A late check out to meet our afternoon flight allowed us a more leisurely pace on our last morning in India, as well as the opportunity to cling to the all too fleeting regal and indulged experience of The Taj Mahal Palace Hotel. During our stay we met a couple from Europe who visit India annually, always staying at the Taj and opting for their Club experience. 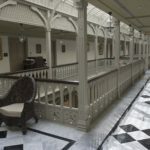 They are committed fans and can attest to the consistent and flawless service and facilities at this magnificent hotel, the flagship of the Taj Hotel brand. This entry was posted in Accommodation, Asia, India, India Accommodation, Maharashtra, Mumbai and tagged 2008 Mumbai terrorist attack, 5 star hotel, Asia, Bombay, butler service, cognac and chocolate tasting, happy hour, India, luxury hotel India, Maharashtra, Mumbai, Taj Mahal Palace Hotel by bontaks. Bookmark the permalink.